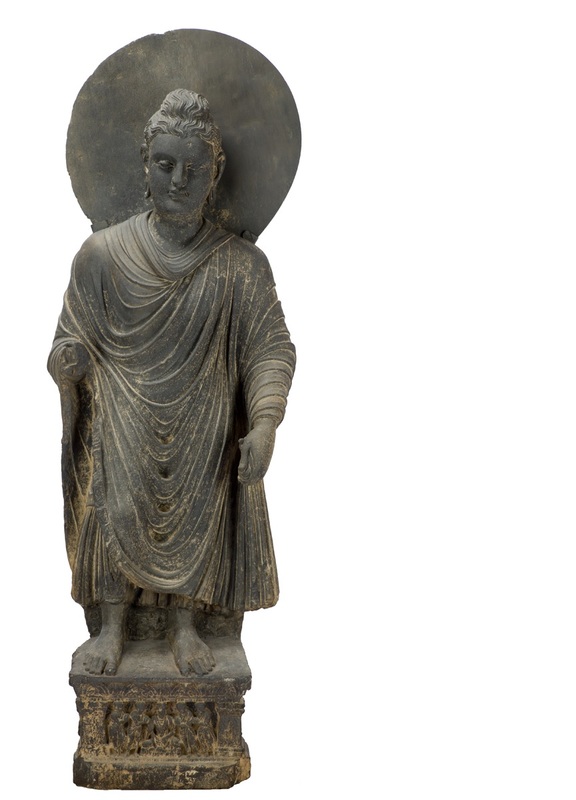 Standing Shakyamuni Buddha, 3rd century A.D.
Two different artistic centers produced early images of the Buddha: Mathura, in the Indian heartland, and Gandhara (now in Pakistan), in the northwest. This standing Buddha from Gandhara, a border area of the Roman Empire, is related stylistically to the late Roman figures of the empire's Asian outposts. Its iconography, however, is Indian, and the image has the customary attributes of a Buddha figure of this period- monastic robe, cranial bump, topknot of hair, dot on the forehead, and long ears. The right arm, broken off, probably made the sign of blessing; the left hand holds the robe in a typical gesture. The scene on the base depicts Shakyamuni, the historical Buddha, preaching, with two disciples on either side. As in many Gandharan Buddhas, the style is a mixture of formulas. While deeply cut drapery falls convincingly over the body, revealing the form beneath, the rigid frontality of the pose works against the naturalism of the slight swaying of the hips and the bent right knee. The figure was originally polychromed or gilded and attached to the wall of a Buddhist building.